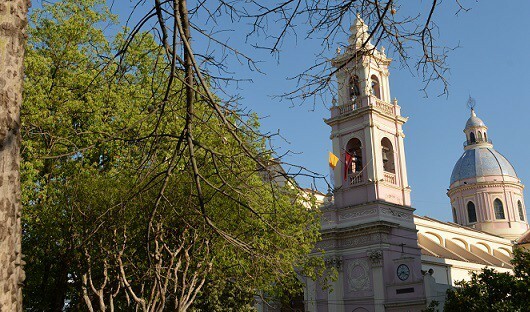 Arrive in the city of Salta, located at an altitude of 1152m in the Lerma Valley. The increasingly popular northwest corner of Argentina comes as a delightful surprise to those who visit. 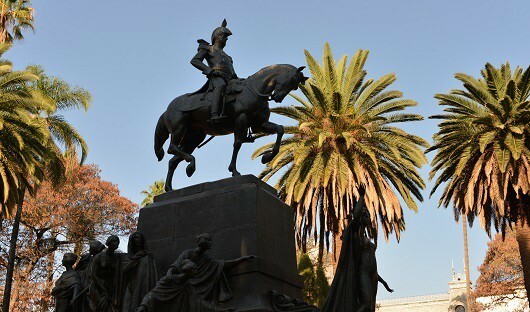 This region is centred on the provincial capital of Salta, Argentina’s best-preserved colonial city. You will be met at the airport by your local guide and transferred to your hotel. A guided tour today visits the main plaza with its beautiful pink coloured cathedral. Nearby is the San Francisco church and San Bernardo convent while from the top of Cerro (Mount) San Bernado there are great views of the city. Later visit the nearby village of San Lorenzo with its wonderful craft market. The morning drive to Cafayate provides stunning scenery and endless photo opportunities. In the afternoon you can visit the village and nearby wineries, famous for their ‘Torrontes’ white wine. 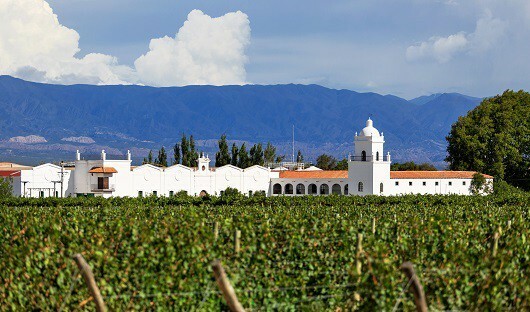 The beautiful Patios de Cafayate Luxury Hotel & Wine Spa is located on the edge of town in the midst of the El Esteco winery. This beautiful boutique hotel was founded in 1892 and offers 32 beautifully restored rooms. Your drive today through the Calchaqui Valley to Cachi is along Route 40, with a lunchtime stop in the village of Molinos and a visit to the Church of San Pedro de Nolasco. Surrounded by impressive mountains, Cachi is renowned for its pure air, sunny days and chilly evenings. This quaint village dating from 1673 has a lovely central plaza surrounded by cobblestone streets and adobe houses and there is an excellent Indian museum. It’s a great place to wander, to kick back and relax, or to enjoy a coffee in one of the numerous cafes. 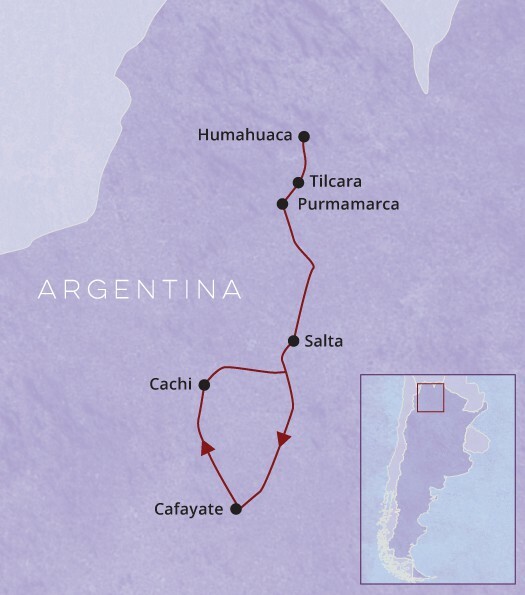 Following Route 33 you return to Salta. The highest point is reached at Piedra del Molino (3620m) from where there are great panoramic views. Your estancia accommodation this night is on the outskirts of the city at the lovely House of Jasmines ‘Estancia de Charme’. 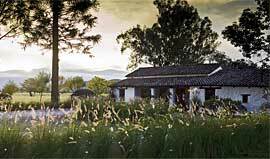 Located on 100 acres of farmland at the foot of the Andes House of Jasmines is a beautiful estancia filled with charm. 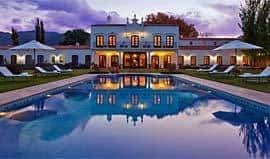 Minutes from the city of Salta your stay will be unique and relaxing. Spa facilities and an outdoor heated pool give you the opportunity to unwind and soak in your surroundings. It’s a short drive to Tilcarra, the archaeological capital of the northwest. Visit the ‘pucará’, a pre-Inca fortress which was subsequently overrun by the Inca and later the Spanish. 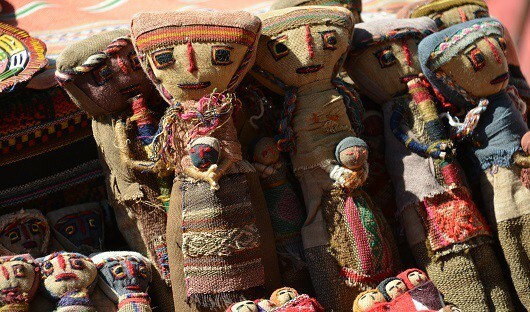 A little further north is Humahuaca village, a great place for lunch and some last-minute handicraft shopping before returning to Purmamarca for your last night. Following breakfast it is a 4-hour drive back to Salta and the end of your trip.